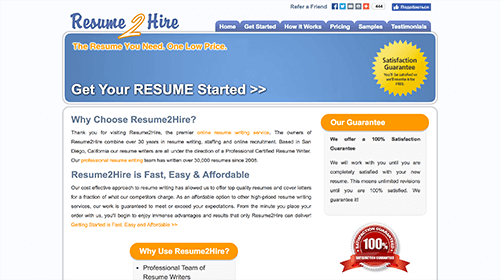 Resume2Hire.com is a parnet of TopResume company. It's another good option for when you’re in need of a resume writing or other job application related service such as LinkedIn and cover letters. Their website it’s straight-forward, meaning it shouldn’t take you long until you figure everything out. The information is spread nicely, so you can take a look at what they have to offer. The offerings are all you probably need for this kind of service: a professional writer which provides a one-on-one service, a low price for an entirely new resume, a less than a week delivery time, and even a new LinkedIn profile makeover. 100% satisfaction or you get a free rewrite. That’s why you should not be afraid to use their service. 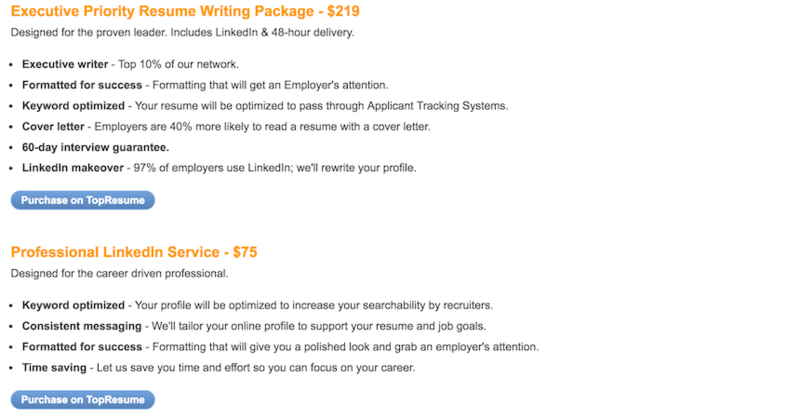 Resume2Hire.com’s pricing is one of the cheapest on the market. There’s a total of four packages you can choose from depending on your needs. The Standard one goes for as low as $99, and the most expensive one goes for $219. All packages offer professionally written content, keyword optimization and are formatted for success. The payment options aren’t the widest on the market, but are more than enough for the average customer. You can choose to purchase using a Visa, MasterCard, American Express or Discover credit or debit card. The waiting time on this website is longer than the one offered by other services. Five to seven business days is what they promise, and what we get for the standard package. If you are in a rush, you can choose the 48-hour delivery which comes with other benefits and goes for $219. Considering other services on the market are offering two to three days waiting time on average, Resume2Hire’s a bit longer than those. This doesn’t affect the quality of the resume in any negative way, so you shouldn’t worry. Customer service is pretty good, with a wide range of offerings from a personalized one-on-one resume service to a satisfaction guarantee seal which means that if the client is not satisfied they will rewrite the resume for free. The service also offers multiple revisions in case the resume is not perfect for you yet. When it comes to website usability, it’s pretty standard. You’ve got your tabs for pricing, samples, testimonials, and all the information on the home page. The site is extremely easy and friendly to use, while also offering all information it has to offer. Ok, I have to admit, at first I wasn’t buying it. I couldn’t trust the quality they claimed. But I was so wrong. I went for the cheapest $99 option which contains only the resume since my intention was just to test the quality, their honesty when it comes to delivery time, and the most important aspect, the customer service. My writer stood on the other side of the line for a few hours until we got the result we both wanted. She was incredibly nice and passionate about her work, which made the whole experience more enjoyable. The resume turned out perfect, exactly how I wanted it, and don’t regret choosing Resume2Hire.com.